1. Heat a large skillet over medium-high heat. Add 2 teaspoons of the oil. Add mushrooms and shallots to pan; cook 5 minutes or until mushrooms begin to brown, stirring occasionally. Remove mushroom mixture from pan. 2. Add 2 more teaspoons oil to pan. Add half of bok choy, cut sides down, to pan; cook 3 minutes. Remove bok choy from pan. Repeat procedure with remaining 2 teaspoons oil and remaining bok choy. Return mushroom mixture and bok choy to pan. 3. Stir in stock, mirin, soy sauce, and ginger; bring to a boil. 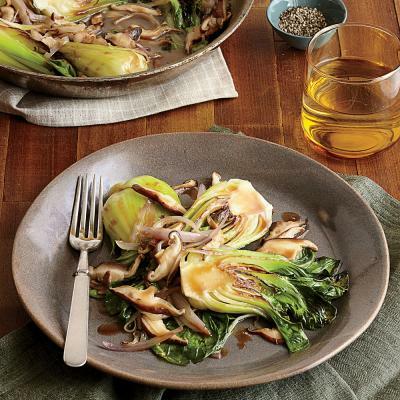 Reduce heat to medium-low; partially cover, and cook 10 minutes or until bok choy is crisp-tender. Uncover and remove bok choy from pan. Bring liquid to a boil; cook 6 minutes or until reduced to about 1/4 cup. Drizzle liquid over bok choy.